The Best Green Cleaning Products PLUS How to Use Them! I would hardly call myself green. OR a good house cleaner. Generally I think I’m a pretty normal mom: doing the best I can without breaking the bank or my sanity. Sound familiar? 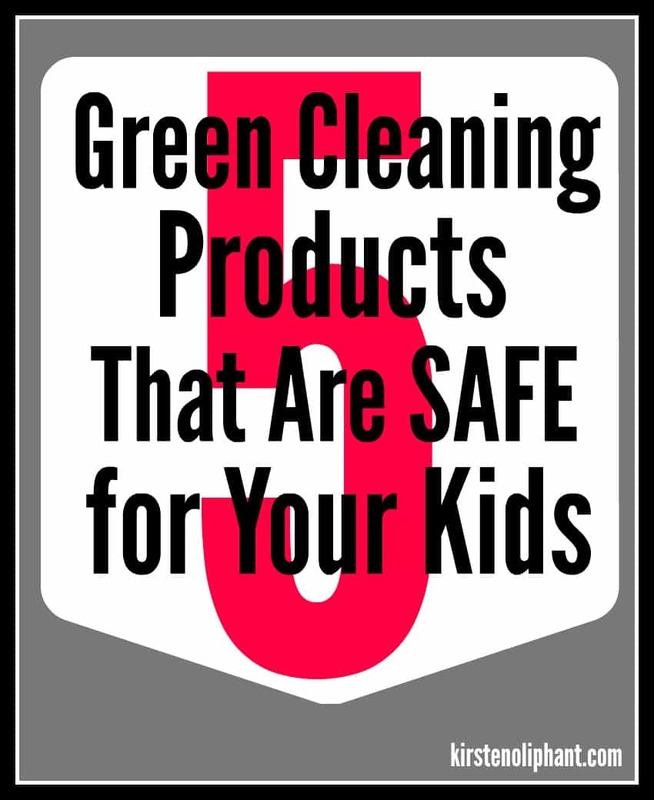 What really got me into green cleaning products was the reality of how dangerous some of the common household cleaners are. I don’t want to get all scare-tactic-y, but the reality is that some of our normal household items can be deadly to our kids, or at the least very dangerous. Like those laundry pods that have been sending 1 kid a day to the hospital. Yikes! Studies show just how great this danger from household cleaners is. (For a great post on why we should care, read THIS!) Everyone cares very much about things like gun safety (and we SHOULD! read my post here on gun safety tips), but we often don’t prioritize the safety of our household cleaners. So for me, I think it’s a great thing that many of the green cleaning products are safer for the greater environment while ALSO being safer for my home environment. 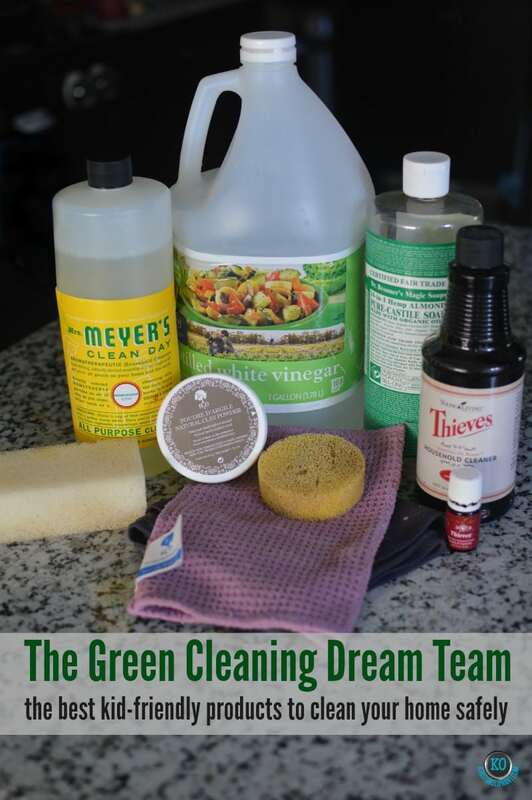 It can seem like a big change to get rid of the normal cleaning staples, so I’m sharing with you my dream team of the BEST green cleaning products for your household and how to use them. I have used all of these and do use them all, fairly interchangeably. Many of these links are affiliate, which means that if you buy a product after clicking through from here, I get a small referral commission. 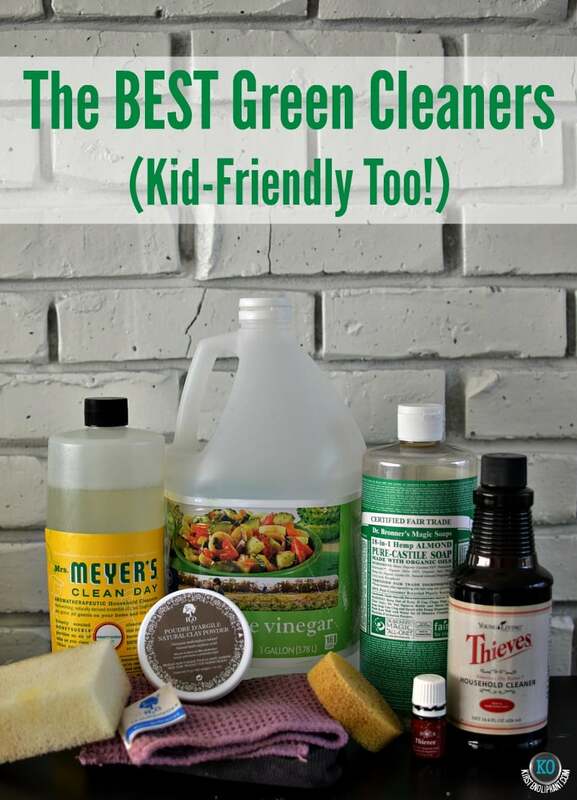 Here are some tips and tricks for kid-friendly, green house cleaning! If you want to go ultra-simple, start with vinegar. I have to confess: I HATE the smell of vinegar. (If you didn’t know, my first blog was named after my hatred of pickles.) Cleaning with vinegar can be a bit of a challenge for that reason, but once it’s dry, the vinegar smell goes away. This is also cheap and you can use it to cook as well. It has so many great properties! 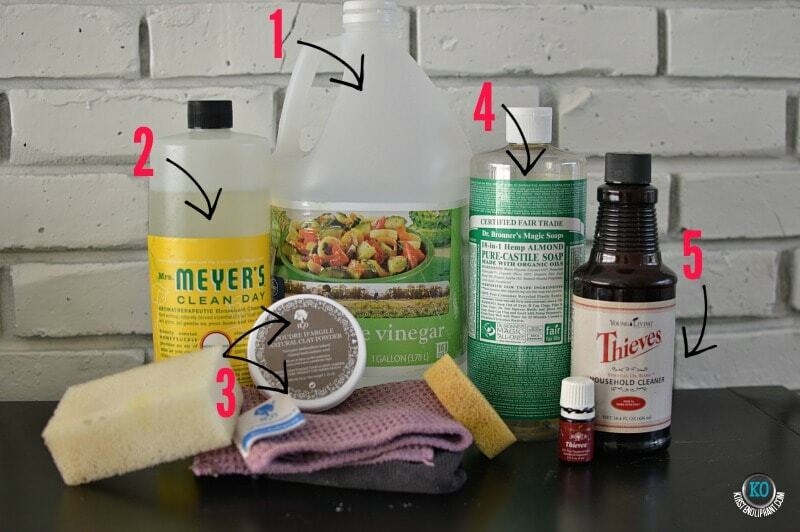 Here are a few ways to use vinegar as a green cleaning product. Toilet Cleaning with Your Kids– I posted last year about how much my boys love cleaning toilets when we use vinegar plus baking soda. It makes a kind of explosion when they react together (remember this is what you use to make volcanoes for school!) and this is a great excitement for kids. 32 Cleaning Ideas for Vinegar– Here is a great list of ways to use and clean your home with vinegar! Things You Shouldn’t Clean with Vinegar– Every product isn’t for every THING. Make sure you know these 6 things you shouldn’t clean with vinegar! Unless your kids have a vinegar allergy (is that a thing? ), using vinegar to clean your home should be totally safe. No worries about storing this in a high place! The smell might even turn your kids away, but if they take a big swig, no harm done. Mrs. Meyer’s Clean Day All Purpose Cleaner is one of the first green cleaners that I used. Well-priced at about $7-8, this concentrated bottle lasts for months. What I love? On the back is a little warning label that says: “If ingested, drink a glass of water.” As opposed to the toxic death warnings and poison control numbers listed on so many of the cleaners widely available in stores. I like that there are a variety of scents. Lavender and Lemon are my favorite! General Cleaning- Fill a spray bottle with water & Mrs. Meyer’s (follow instructions on the back) and use on countertops, bathtubs, toilets, floors—EVERYWHERE! H2O at Home is a line of products that is fairly new to me. A friend of mine sent me a few things to try (look for a giveaway soon!) and I LOVE them. Like, REALLY REALLY love them. The idea of this company is to remove chemicals and unnecessary products from your home and use WATER. They make several high tech micro fiber cleaning rags, which they call Chiffonnettes. One is for glass, one for general surfaces, and one for heavy duty. My favorite is the heavy-duty Chiffonnette, which I used mostly on our tables, chairs, and kitchen counters. I can FEEL the difference while cleaning and see the difference: no streaks. The glass Chiffonnette will actuallyl give you a streak-free mirror or window with nothing but water. Insane, right? You can read more about H2O at home here. I can safely say that I don’t know how I’ll ever use another cleaning cloth after trying these. 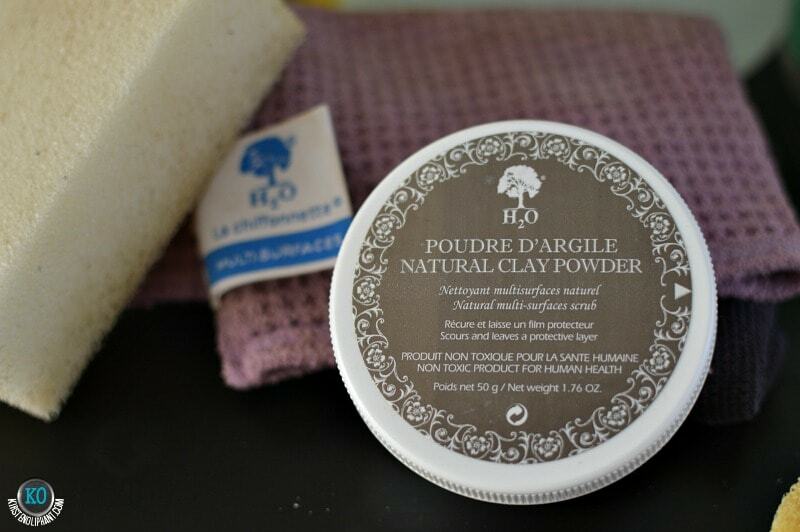 There is also a scouring clay (pictured in the white tub) that is fabulous for just about everywhere! I’ve used it on counters, sinks, the oven, and the bathtub. It is super easy to use and the products are all highly concentrated NATURAL ingredients. I have barely made a dent in the small container of clay (and it’s not just because I am not the best house cleaner). These are a great product to use especially if you care about packaging as well because the packaging is biodegradable. AsCheck out more of their products on Kara’s H2O at Home page! I love Dr. Bronner’s Soap ! It is derived from plant products rather than synthetic chemicals, so it’s safe and less harsh on the environment. Like Mrs. Meyer’s, it is a concentrate, so a little goes a long way and it lasts a long time. I will say after using it that if you use it as dishwashing soap or hand soap, it has a different consistency, which can be odd. It’s a lot thinner, so might work better as a hand soap in one of those foaming soap containers . You can find it in many stores now or on Amazon for a great price, especially considering how long it lasts. (A bottle lasts me almost a year.) Here are a few great tips on how to use it. Great Ways to Use Dr. Bronner’s Soap– This post helped get me started on Dr. Bronner’s. 10 Products to Replace with Dr. Bronner’s– This is a very practical guide to show you how you can stop buying so many other products in favor of using Dr. Bronner’s. I am a very quiet seller of Young Living Essential Oils. Quiet as in: Did you KNOW that I sell them? Probably not. But I do LOVE them and Thieves is the #1 reason. It starts as a shallow reason—Thieves smells amazing. Spicy and Christmas-y and wonderful. It also contains a blend of therapeutic-grade, purifying essential oils that fight off microorganisms (even bacteria & mold!) without exposing you or your household to harsh synthetic chemicals. All the while smelling of Christmas! A bottle of Thieves cleaner is also concentrated, so it can last a long time. Because Thieves has so many great properties, I feel like I’m not just NOT harming the environment, I’m doing GOOD in my home. (Plus, did I MENTION it smells like Christmas?) Thieves Essential Oil is also fabulous for other cleaners, and there are tons of uses for essential oils around the home. Here are more links for ways to use Thieves and essential oils in the home! Ways to Use Thieves Cleaner at Home– 20 different household ways to clean from Don’t Mess with Mama. 30 Homemade Essential Oils Recipes- This is a popular roundup I’ve done with everything from laundry soap to face scrub. 50 Ways to Use Thieves- This is a super comprehensive list of ways to use Thieves oil. If you want to know more about essential oils and Thieves in particular, shoot me an email! I’d love to tell you how you can get set up with a fabulous set of oils (or the Thieves line) and get wholesale discounts without feeling all sales-y…unless you want to be sales-y. With ALL of these cleaners, you still want to be cautious and smart. Other than vinegar, your kids shouldn’t be eating these things. (Though if they DO, you are much better off than if your child gets even something like dishwasher detergent.) Most have a keep-out-of-eyes warning, so be practical. I hope all of these will help you feel better about the environment large AND small. And if you hate cleaning as much as I do, here are a few links from Moms Confession to get you in the cleaning mode! What are YOUR favorite cleaners and cleaning tips? Are you passionate about using green cleaning products? I use vinegar in my laundry. I’ve got a front load washing machine, and because they use less water than traditional top load machines getting odors out of clothing and towels can be a real problem. Especially with two young adults in the house that leave their towels heaped in a corner of their bedrooms. A bit of vinegar in the bleach and fabric softener dispensers is the only way I’ve found to take care of the problem without wrecking clothing with bleach. It’s really great that people are sharing this innoomatirf. These are all great alternatives, EXCEPT, Thieves is NOT kid safe. It has age restricted oils in it and should not be used around small children. Eucalyptus oil is unsafe for children under 10 years old. The 1,8-cineole content is way too high for young lungs to handle. It has been known to slow respiratory function to the point of stopping. No, its not going to happen to every child that comes into contact with it, but seriously, why take the chance? Same thing with Rosemary. Too high of a 1,8-cineole content. Anything over 40% 1,8-cineole is not recommended for under 10 by the worlds leading authorities on oils like Robert Tisserand and Sylla-Hanger Sheppard. Hi, you provided great reasons for making your own green cleaning products. Thanks for sharing! You’ve actually not just given the best must-haves for the cleaning products. You’ve taught everyone too, the proper way of using them! Oh, yes! It is important that the green products we use are not just eco-friendly but kids-friendly too! This is such an awesome post. Thanks for sharing! I love all of these green cleaning products and so many of these I already have around the house! Thanks for sharing! Glad you mention what not to clean with vinegar. Love the idea that Thieves smells like Christmas. I’ve never heard of the product before. My dog’s all natural flea medication smells like that too. Probably has some of the same essential oils. Great selection of products. I always try firs baking soda and vinegar. If those cant help I move on with commercial products. Not having any chemicals in the house really is a godsend, I have young children and pets and I no longer have to put child locks on my cupbaord doors! Great products to use in your home! I love that they are all kid safe. If the tile and carpet are giving you too much trouble, I would suggest using Chem-Dry. They use family safe products and minimal water! So no chance of mold or mildew.